CO2 is less environmentally harmful than many of the gases previously used in these refrigeration applications, having a significantly lower Global Warming Potential (GWP)than HFC and HCFC refrigerants. Some of these gases, such as R-404A, are beginning to be phased out of use due to environmental impact and regulations. These factors contribute towards CO2 becoming an increasingly attractive option for use when balanced against the requirements of regulations such as F-Gas (EU Regulation No. 517/2014), and the US EPA Clean Air Act Section 608. Furthermore, the manufacturers of refrigeration systems continue to develop a growing range of ever more efficient and cost-effective CO2 refrigeration system options, enabling their wider adoption into commercial applications. other refrigerated spaces, including cold rooms and walk-in freezers. Where larger refrigerant charge sizes are used, the potential for mandated refrigerant leak detection in larger spaces, such as storage freezers, is increased. As with all refrigeration systems, over time there is the potential for leaks to occur. Causes can include improper maintenance, mechanical wear, inadvertent damage or improper maintenance. With pressurized systems, these factors can contribute to a significantly higher risk of leaks. Due to design requirements, CO2 refrigeration systems typically operate at high pressures; sub-critical or trans-critical system pressure ratings often operate in excess of 2,000 PSI. These high pressure ranges mean that in the event of a major CO2leak, the gas can escape into a space at very high leak rates. A leak of CO2 at a rate of 7.5lb/hour, or 3.4kg/hour, will create an atmosphere containing 5,240 ppm of CO2 in just 5 minutes. This surpasses the OEL and reaches a level to which workers should not be exposed. A leak of CO2 at a higher rate of 1lb/minute, or 454g/minute, will create an atmosphere containing 41,920 ppm of CO2 in just 5 minutes. This surpasses the IDLH level, and would be highly and immediately dangerous to personnel entering the space. These theoretical examples show that CO2 leaks in refrigerated spaces have the potential to become dangerous very quickly. Effective CO2 leak detection can be an essential tool in maintaining a safe environment. CO2 is monitored in a wide variety of applications, including Indoor Air Quality (IAQ), occupational workplaces and refrigeration applications. However, it should be noted that not all CO2 monitoring devices are suitable for leak detection in refrigeration applications. Two key factors that should be considered when looking for a suitable CO2 leak detector relative to the applicable application are Response Time and Operating Temperature. The rate at which CO2 can leak and create a dangerous environment makes response time a critical factor in delivering effective CO2 leak detection. Instruments suited for monitoring of gradual changes in the atmospheric CO2 level, such as used in IAQ applications, may not be suitable for leak detection purposes, where a fast response is needed to ensure that a dangerous working environment is not created and/or entered. 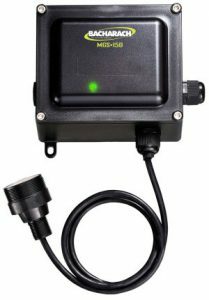 It should be advocated to review both the stated response time of the sensor being used in a leak detector, and most importantly the response time of the instrument. Different instrument designs can affect how quickly gas can diffuse into a CO2 sensor. For example, a sensor can be directly presented to the atmosphere being monitored, thereby helping deliver a fast response time, or the gas may need to diffuse down a capillary tube to enter the sensor which would significantly increase the response time of the instrument and negate the stated response time of the sensor itself. 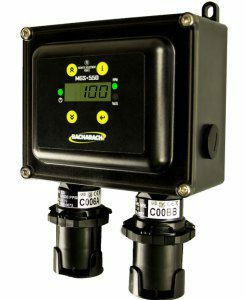 It is imperative that the gas detector response time is appropriate for the designated application to provide the benefit of its intended use. Operating temperature is also a key factor in selecting an appropriate CO2 leak detector for a refrigeration application. There are comparatively few CO2 sensors available on the market that are specified for use at temperatures lower than 0°C / 32°F, with response times required for effective use in the refrigerant gas detection applications. As the use of CO2 in refrigeration continues to grow, it becomes imperative to ensure that sensors appropriate for use in low temperature environments are used by instrument manufacturers whose products are intended for leak detection in refrigerated spaces. Fundamentally, it can’t be determined what behavior a sensor would exhibit if run outside of its specified operating range without test data, as each sensor may behave differently. What can be stated, is that any reading could be invalid and the device behavior could be undefined. At best, the sensor may be inoperable and a fault detected; at worst an invalid or inaccurate reading may be provided. It could be argued that a sensor operating outside of its designed specifications is less useful than none at all, as it may provide false confidence the gas level is being accurately monitored and its benefit of installation and use is nullified, creating risk of exposure. CO2 refrigeration systems are increasingly used in commercial applications, a trend which is expected to continue. 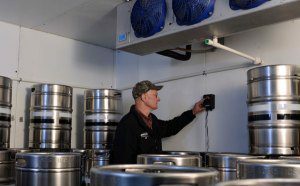 In turn, this creates an increasing need for effective CO2 leak detection systems to be employed, helping to enhance the safety of those working in refrigerated spaces. CO2 can be a dangerous gas in sufficient volumes, so care should be taken in selecting an effective solution with an appropriate response time and operating temperature.